I'm slowly getting into the season. We got our tree yesterday - and I know I say this every year, but this one might be the best. Sure, in this pic, it is still all trussed up like a pig, but we cut off the netting, eventually to let it relax. 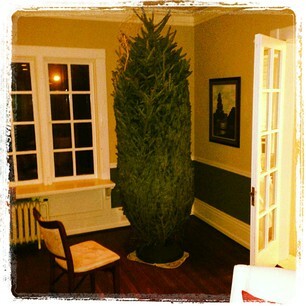 The way I figured it, we get the tree this last weekend, or we don't get one at all. My work travel wouldn't allow much buffer to get one and decorated before the holiday itself. I'm hoping 710 puts lights on while I'm gone. I'm happy to do the rest. This will actually be Petey's first tree - kind of. In his old house, he was not allowed in the room that had the tree, but we don't have that limitation, so he'll walk by it several times a day. I guess we'll have to see what ornament work and don't at lower levels. Maybe he won't even bother a thing, but we'll keep an eye on him. We even got a few presents purchased for the nieces and nephews. So, I feel we're on the way. I'm on the way. ...and I'm on the way.....back to California. Hopefully to be my last trip for 2012, but who the heck knows. It is possible I will have one more. So, more from the west coast. The spirit has been hard to find this year - with Sandy, a very early Thanksgiving and the very warm weather. Nice to read that you and most are finally feeling it. Beware of Petey and the tree. He may be tempted to mark it. Is it decorated yet? I want to see it all pretty with lights. You should get a squirrel for the tree. That would liven things up.